You can exit on Interstate 70 and you will be heading north on Ohio route 48. 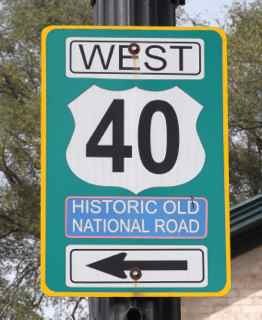 As you are climbing up the hill you will notice the famous Old National Road sign. 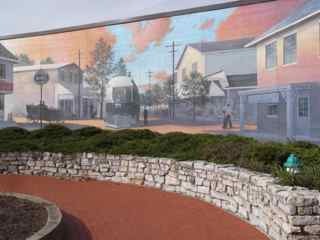 At the intersection of route 48 and the Old National Road you can see a wonderful mural of that area in the older times. Although Englewood was not actually founded until 1841, many early settlers began to come to the area around 1800. The early settlers made their living basically from agriculture. In 1898, the local businessmen conducted a contest to choose a new name for the town and the name Englewood was chosen as the winner of that contest. The Village of Englewood was incorporated on May 15, 1914. After wandering around then get back on route 40 and head east. 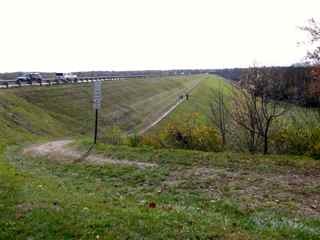 Englewood Dam is an earthen embankment located across the Stillwater River and U.S. 40 goes across the top of the dam. Construction of the dam began in February of 1918 and was completed in December of 1921. 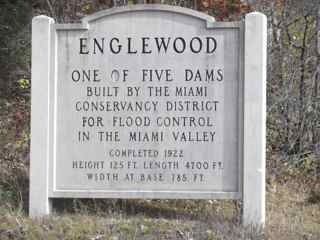 The Englewood Dam was one of the largest of its kind in the world. Adjacent to this sign is the Englewood MetroPark which continues to be one of the most visited parks in the district today. The natural areas of the park contain floodplain forests, large areas of former farmland in natural succession, second growth upland hardwood forest, significant remnants of mature and old growth forest, a large shallow lake/wetland, several managed grasslands, and the scenic Stillwater River. Hiking and bridle trails lead visitors to some of its most spectacular features. The main road through the park is marked with a bike lane and offers scenic cycling and a connection to the regional Stillwater Bikeway. Englewood MetroPark provides the setting for fishing, birdwatching and picnicking. Discover the beauty of woodlands, meadows and three waterfalls. Enjoy scenic hiking, recreation and bridle trails. Englewood MetroPark also offers fossil collecting, canoeing and kayaking. Each season highlights different wonders of nature including spring wildflowers blanketing the forest floor, plants and trees dressed in full foliage in summer, the warm colors of fall leaves and frozen waterfalls in winter. After wandering around, seeing the lakes and trees, you then get back on Route 40. When you see the Aullwood Road follow that. 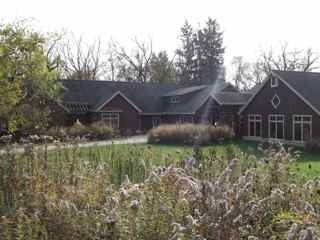 In 1957 Marie Aull gave her land to the Miami Valley, creating National Audubon Society&apos;s first nature center in the Midwest. Today as visitors explore the Marie S. Aull Education Center, walk the trails and experience Aullwood&apos;s organic farm. More than 110,000 people-- tots, school children, teens, and adults -- are engaged in exciting on-site or outreach programs every year. 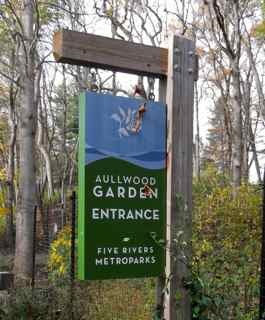 By nourishing familiarity with nature and sustainable agriculture, Aullwood stimulates many visitors to environmental activism. Today, more than fifty years after Marie Aull&apos;s gift, the Aullwood Audubon Center and Farm continues to be an enjoyable and exciting place to visit. 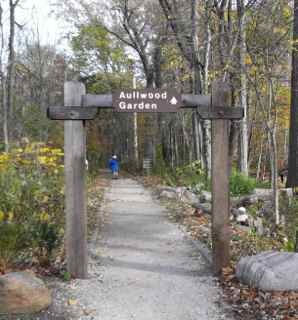 With over 200 acres of nature sanctuary with six miles of trails through prairie, forests, marsh, ponds, and meadows, Aullwood provides experiences and activities that increase understanding and preservation of the planet through education, research, and recreation. If you keep following that road you will get very low and see the dam from the bottom. Find a parking space. In there is a gorgeous trail and a stream. And as you follow along you will then come to a road and a special garden across the street. For decades, this living work of art has touched visitors emotionally and spiritually with its diversity and abundance of floral displays, towering trees and serenity. The 31-acre park has a picturesque creek, prairie, woods, and gardens planted with native & exotic flowers. 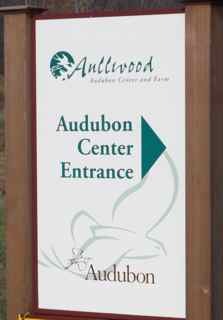 Conveniently located just south of US 40 past the Aullwood Audubon Center in Dayton. You have now seen and experienced a wonderful aspect of the Greater Dayton area. 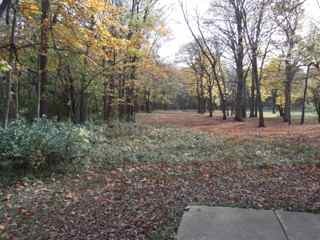 Please note: The Dayton CVB has compensated me to share my thoughts on the Englewood, Five Rivers MetroPark, & Aullwood Gardens.